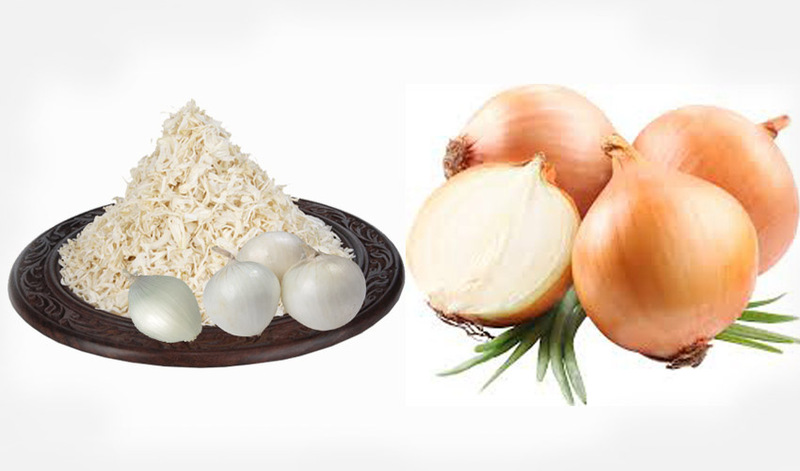 Dehydrated Garlic : Garlic Food Products in India: How Are Onions Dehydrated And Packed? How Are Onions Dehydrated And Packed? Onion is the main item used in many food items. Onions make every item taste good. Thus, dehydrated onions are good food storage items. Onions add flavor to main dishes, sauces, meats, salads, nutrition to rice & beans etc. For any person, the first item to add flavor to food will be salt. Onion would be the immediate next choice for everyone. The equipment needed for dehydration of onions is airtight containers to store onions, canning funnel, dehydrator and of course fresh onions. A lot of onion top goes waste while harvesting the onion bulb. The top of green onions have a great flavor. We can dehydrate both the green part of the onion as well as onion bulb. Grading & peeling: The first step involves selecting the onions with good size and quality. The selected onions are peeled neatly. Then the top layers on the peeled raw onion bulbs are removed. Washing & slicing: This step involves washing the peeled up onions and cutting them into slicing using a slicing machine. Onions are washed maintaining a strict hygiene. Drying: An imperial dryer is used for dehydration in which the peeled up onion slices are fed. This step doesn't effect the pungency and taste of the onions. Kibbling & sorting: After dehydration, the dehydrated onions are shifted to air conditioned rooms which are very clean and neat. Then the dehydrated onions are fed into kibbling machine to obtain kibbled form. Using blowers, the kibbled form onion's skins are removed. Further impurities are removed by manual sorting. Metal detector passing: All the metal impurities are removed by passing this product through metal detectors and high power magnetic sticks. Sizing: kibbled onions undergo sizing and milling. Packing: The final product is weighed and then sealed in poly bags which are moisture proof and food grade bags. Then these bags are packed in paper bags or corrugated boxes. After packing, these dehydrated onions are thus exported. Dehydrated onions are used in the form of Dehydrated onions flakes, Dehydrated onions chopped, Dehydrated onions powder, Dehydrated onions minced Dehydrated onions granules. Dehydrated onions can be rehydrated through another process. Due to the loss of water content, this will not make us cry like the normal onions.